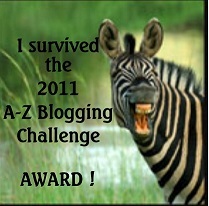 Today we have two short posts from 2011 participants in the Blogging from A to Z April Challenge. First a short endorsement from KRISTINE ASSELIN who writes contemporary young adult and middle grade fiction and middle grade nonfiction as well as the occasional picture book. And she still made some time to blog from A to Z in April of 2011. I'll admit that I didn't comment as heartily on others blogs as the month progressed, but I did "meet" some great bloggers through this event. Thanks to Elizabeth Mueller for creating this award. 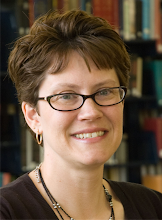 Up next we hear from Loralie Hall who assessed the Blogging from A to Z April Challenge on her blog Apathy's Hero. Loralie is a writer who has several things going these days. For anyone who is mourning the passing of the A-Z blogging challenge, or wondered what kind of inanities I'd come up with now that I don't have letters to motivate me, fear not. The wonderful folks who started the whole thing are hosting a reflections blog hop. It's been an interesting month. Like with a lot of things, when I signed up I didn't pour too much thought into how I would get the task done. I blog five days a week anyway, and even though Saturday is the one day I never blog, I figured it wouldn't be a big deal for four weeks. And the kind folks I used to work for laid me off a week before the challenge started. So that meant even more free time to blog. As long as I could slog my way through the more negative repercussions of unemployment. And then I found out that thinking up words that start with each letter is easy. Relating them to writing...took a bit of a stretch of the imagination on my part. I'm pretty sure on most days I didn't quite follow my own themes. It was all worth it though. The challenge was nice, but for me the best part was all the new people I met. I have more followers now *waves*. But even better, I discovered some amazing new bloggers and talent out there. I didn't comment on every site, but I visited each and every one and I was amazed with what I discovered. The diversity in theme, blogging style, thought process, all of it, was wonderful. In the end, I'm super happy I signed up, and thrilled I got to meet you all. I'd do it again without hesitation, and I can't thank the organizers and participants enough. Writers like the A to Z Challenge because it adds another dimension to the writing experience and it allows them do stretch a bit while having a good time writing. It's also a great way to network. If you're blogging anyway, you might as well blog from A to Z with us in April. Hi Lee .. you certainly had loads of takers for these A - Z reflections ..
.. and though I possibly looked at both bloggers back then -I possibly passed them by .. so now I can take another look. Hi Kristine .. oh I know instructions can be so simple, but my mind gets numb blowingly dumb! I did get thrown completely by someone who post Z - A .. that threw me .. !! Glad you enjoyed it ..
Hi Loralie .. well I guess being made redundant as the A - Z started may have been a blessing in disguise - and gave you something to focus on. Hope you have some work sorted out by now. Glad to read you'll be doing it this year .. I'm betting A to Z hits 2000 participants this year, which will make it hard to read and comment on every blog, but I'm thinking of setting a goal of doing it by June 30. Lee, this was a great idea, it's been fun reading all of the experiences from past participants! That's what it's all about - making new friends! Loralie lost her job before the challenge? Wow, that is rough. What a great attitude to continue moving forward. Thanks for the great memory--it was blast participating in the challenge last year. Here's to 2012! I agree with your last statement, Lee; if people are blogging anyway why not join in the fun! The more the merrier, eh? Last year we were surprised by the sign-ups. This year should be another surprise. Kristine, there was a lot to it, though also a lot of fun. Impressive that you signed up last minute and were away for a week and still made it! Loralie, I definitely hear you on the words being easy to think of, but relating it to writing being harder. My posts all revolved around writing, too.